The Pope’s famous and controversial encyclical Laudato Si’ focuses on humanity’s desecration of the global environment, but it also contains a striking challenge to the core tenets of the capitalist system, the willingness of so many to look at anything and everything as an opportunity to make money no matter what the consequences. Would it be a surprise to learn that the people are making all sorts of money off the Pope’s visit to the U.S.? Some of the profiteering is of the petty sort, albeit pretty reprehensible. In New York City, some lowlifes are reselling the free tickets they got to see the Pope’s Central Park process for $750 each on Craigslist. Baltimore’s WBAL reports that scalped tickets are being offered for as much as $1,000. eBay has prohibited sales of tickets to see the Pope, but Craigslist has not yet done the same, as far as we know. Creatively, funny, but still questionable are the t-shirt sellers like faithadelphia.com, hawking “Yo Pontiff” and other t-shirts for $20 or more a pop and promising “a portion of all sales to designated Catholic Children’s Charities in the Philadelphia region.” How much of the sales price and which charities will benefit is information available on request to the company, owned by “Clothing Scott” Soffen. A ticket scalper, a t-shirt hawker, even a homeowner making a home available for a couple of thousand a night to people visiting Philadelphia to see the Pope (the average rental in Philadelphia during the Pope’s visit listed on HomeAway is $1,690 a night, eight times the average normal rate) are small potatoes compared to the financial benefit—or perhaps the even more important reputational benefit—some corporations are seeking from getting close to Pope Francis. Some of the corporate involvement is a bit more difficult to understand. For example, the officially approved merchandising vendor for the World Meeting of Families Congress is the Philadelphia-based Aramark Company. 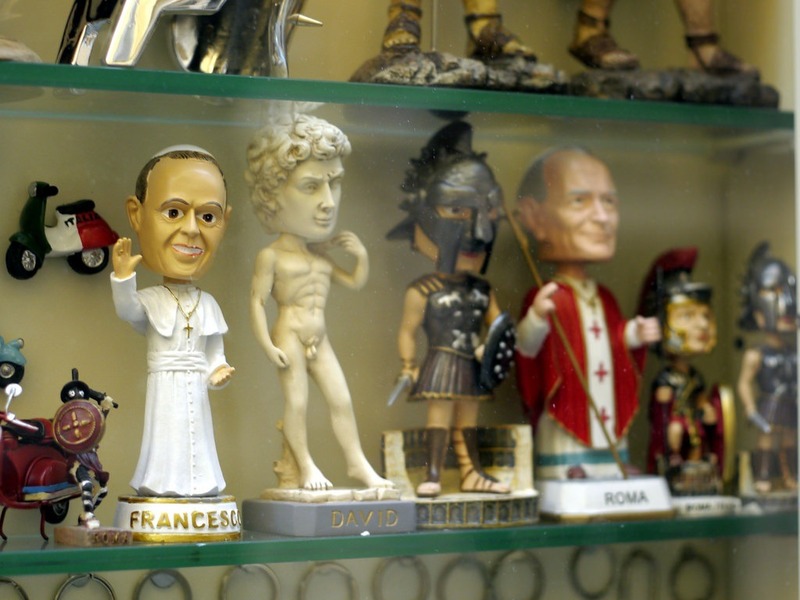 Its “pop-up Pope shops” are selling commemorative pins, plush dolls of the Pope ($20), life-sized cardboard cutouts of the Pope ($160), a sterling silver cross ($500), and commemorative rosaries (running from $10 to $200). Aramark also happens to run prison kitchens all across the country, though no longer in Michigan, where authorities found Aramark food with maggots and other unpalatable offerings, according to Alan Pyke for ThinkProgress. The Pope is scheduled to visit the Philadelphia city jail, whose kitchen is an Aramark-contracted operation.